So, nearly ten years later living here in the Northland, I am still astounded by it. This morning it was negative six degrees as I was driving down to my job and I witnessed the sunrise. You might be thinking to yourself in response to that "Wow! She must have gotten up early!" But here's the thing. The sun rose this morning at SEVEN freaking FOURTY-FIVE! And it is planning on going down at freaking FOUR THIRTY!?! For those of you who are math-impaired, that adds up to just over eight hours of daylight. Anyway, on my way to school, I saw a rainbow. 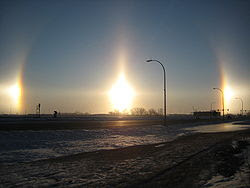 So, I called Cousin, who has the largest breadth of knowledge of anyone I know and she replied immediately that I had seen a Sun Dog. That's pretty sweet. I've never heard of a Sun Dog. I spent a couple of weeks in Alaska one summer and participated in a midnight softball league. It was midnight, but looked like high noon! Crazy, being on top of the world, huh? By the way, nice blog name! Thanks! I would love to go to Alaska and see all of that. Welcome to the blog!